, T101 is turned on, T101 normally open contact closure, T102 is started, the start time; When the T102 current value of SV reaches its set value PT (5s), T102 is turned on, normally closed contacts disconnect T102, T101 reset, T101 makes the current value SV = 0, T101 normally open contacts disconnect, T102 reset, T102 NC contact is closed, T101 restarted, begin the next cycle. An electrical start of the conveyor belt, At the beginning of the conveyor belt has two push button switches: S1 for START and a STOP of the S2. There are three motors M1, M2, M3, press the start button to start M1, M2 starts after delay 5s, M3 starts after 16s. This entry was posted in plc program and tagged PLC Ladder Logic on June 29, 2016 by arco. This entry was posted in plc program and tagged PLC Ladder Logic, PLC programming on June 29, 2016 by arco. 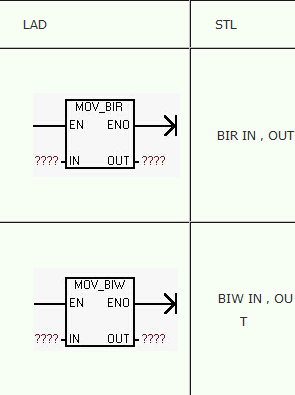 Bytes read instruction immediately (MOV-BIR) reads the actual input IN the 1–byte values, and write OUT the result as the specified storage unit, but the input image register has not been updated. That is the condition for the alarm input X0 X0 = ON alarm requirements. Alarm lamp output Y0, Y1 alarm buzzer. X1 alarm response, alarm X1 after blinking and stays ON Y0, Y1 tweet closed. 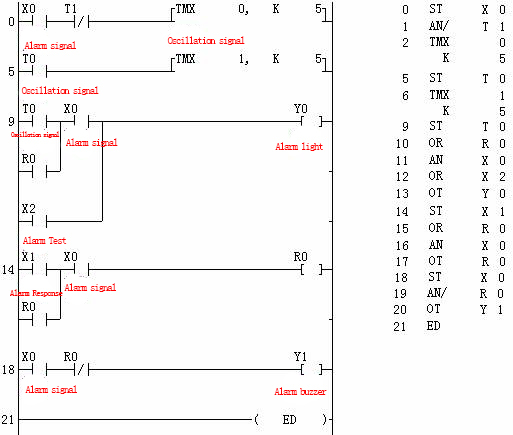 X2 is alarm lamp test signal, i.e., Y0 X2 turns ON. ①Y0 need an oscillator signal. ② alarm response after Y0 after flash lit, so the application of an intermediate relay R0 will hold X1 signal and with R0 normally open contact in parallel with the oscillating signal to reach steady Y0 purpose, while the normally closed contact with R0 disconnect the buzzer Y1. 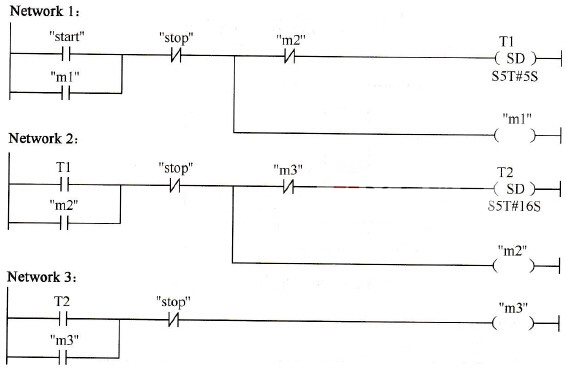 This entry was posted in plc program and tagged PLC ladder, PLC ladder diagram, PLC Ladder Logic on June 27, 2016 by arco. With a start button QA, a stop button TA D to achieve a motor start, stop control. Its AC contactor for KM. 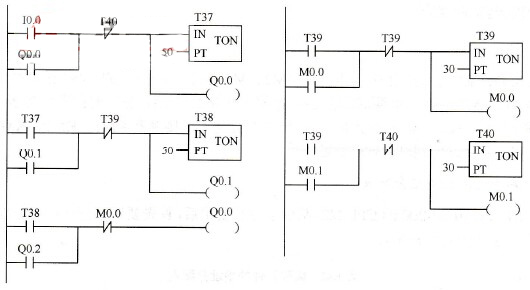 Draw terminal wiring diagram of the control system; lists the I / O allocation table; design ladder. 0 when input contact input terminal (QA) is turned on, input relay X0 coil excited, its normally open contact closure X0, Y0 output relay coil is excited by its normally open contacts self-retaining. KM AC contactor is energized, the motor starts normally. When No. 1 input contact input terminal (TA) is turned on, enter the relay coil Xl stimulated, the normally closed contacts to open Y0 coil energized and open self-locking, the motor stops running. In programming the PLC, start, reset circuit is the most basic common electrical control circuit, and a variety of programming methods. 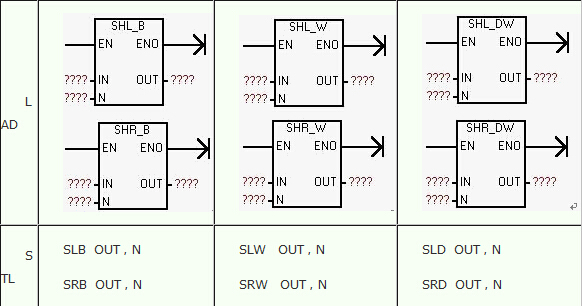 This entry was posted in plc program and tagged PLC ladder diagram, PLC Ladder Logic, PLC programming on June 27, 2016 by arco. 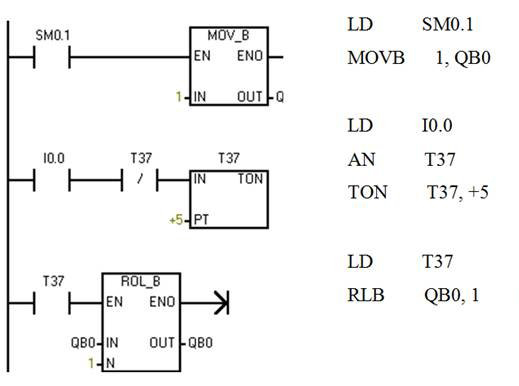 (1) Shift Register instruction SHRB the DATA value into the shift register. 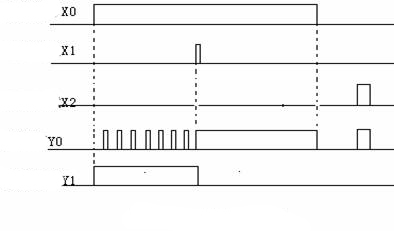 Ladder, EN enable input is connected to the shift pulse signal, each effective when enabled, moving an entire shift register.DATA data input connected binary value shifted into the shift register, the instruction is executed when bit value into register.S_BIT specify the minimum bit shift register. 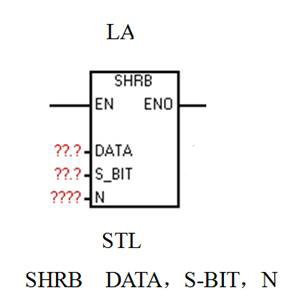 N specifies the length and shift direction of the shift register, the maximum length of the shift register is 64, N is a positive value indicates a left shift, the input data (DATA) into the shift register, the least significant bit (S_BIT), and out of the shift the highest bit register.Out of the data is placed in the overflow memory bit (SM1.1) in.N is a negative value indicates a right shift, the input data is shifted into the most significant bit of the shift register, and shifted the least significant bit (S_BIT). 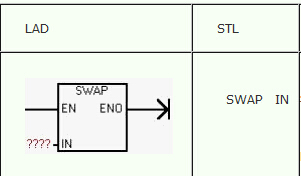 Out of the data is placed in the overflow memory bit (SM1.1) in. (2) operand DATA and S-BIT was I, Q, M, SM, T, C, V, S, L. Data type: BOOL variables.Operand N is VB, IB, QB, MB, SB, SMB, LB, AC, constant. Data type: Byte. 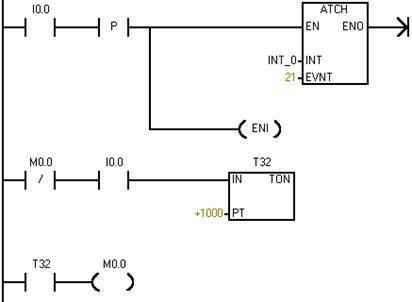 (3) Error conditions that set ENO = 0: The 0006 (indirect address), 0091 (operand out of range), 0092 (error in count field). (4) the impact of special internal shift instruction flag: SM1.1 (a bit of value out of the overflow bit is set). This entry was posted in plc program and tagged PLC ladder diagram, PLC Ladder Logic on June 24, 2016 by arco. From left to right at a speed of 0.5s were lit to keep any one time only one light is on, after arriving at the far right, then lit from left to right. 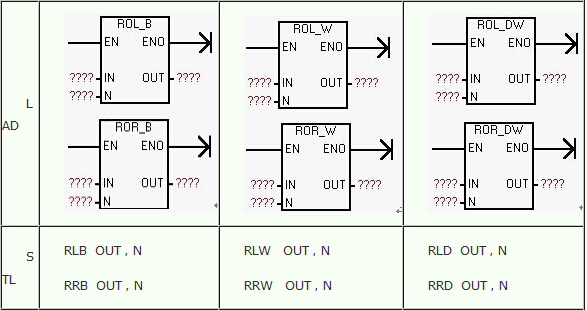 This entry was posted in plc program and tagged PLC ladder, PLC ladder diagram, PLC Ladder Logic on June 24, 2016 by arco. This entry was posted in plc program and tagged PLC Ladder Logic, PLC programming on June 24, 2016 by arco. Logic Control Instructions refers jumps and circular logic block instructions. Jump or loop instruction operand is the address label, the address label stating that the program to jump to where the label of up to four characters, the first character must be a letter, the remaining characters can be letters or numbers. Word logic instruction word (16-bit) or two double word (32 bits) bit by bit logical operations. Two number one in accumulator 1, the other may or instruction to immediate (constant) given by way of the accumulator 2, the logical operation result word logic operation instruction in ACCU 1 the double word logic operation result is stored in accumulator 1. the contents of accumulator 2 remain unchanged. Logic operation Affected flag status word. 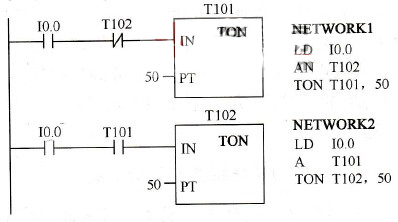 If the result of logic operation is 0, the CCl bit is reset to 0. If the result of logic operation is non-zero, then the CCl is set to 1. In any case, the status word bits CC0 and OV are reset to zero. * STL statement format: AWNote: When the enable input EN input is “1”, the IN1 and IN2 from the two ends of the phase-by-16-bit binary data and outputs the result from the OUT terminal. Enable output ENO = enable input EN. * STL statement format: XOWNote: When the enable input EN input is “1”, the IN1 and IN2 from the two ends of the 16-bit binary data bit by bit XOR result is output by the OUT terminal. Enable output ENO = enable input EN. Description: open a data block as a shared data block (DB) or as an instance data block (DI). You can open a shared data block and one instance data block at the same time. T M W22 // transfer low word of accumulator 1 to M W22. Description: Exchange shared data block and instance data block. instance data block becomes shared data block. Explanation: The length of shared data block is loaded into the accumulator 1. Description: The number of shared data block is loaded into the accumulator 1. Explanation: The length of instance data block is loaded into the accumulator 1. Description: The number of instance data block is loaded into the accumulator 1. This entry was posted in plc program and tagged PLC ladder, PLC Ladder Logic on June 24, 2016 by arco. 1. When the enable input EN = 1, the implementation of double word left instruction cycle. The 32 pairs of words left cyclic N bits from the input terminal IN, the output from the OUT terminal. 2. N-ended input frequency to be shifted. 3. If N is not equal to 0, then the instruction is executed, CC0 and OV bits are always equal to zero. 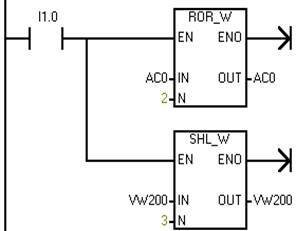 This entry was posted in plc program and tagged PLC Ladder Logic on June 24, 2016 by arco.